As we reflect on lessons learned from the MDGs and set strategies for improving global maternal health, it’s time to identify what has worked and what more is needed to not only avert preventable maternal deaths, but also provide quality health care for every woman. The most prominent knowledge gap that remains is implementation research for health systems strengthening. Not only do we need to identify the most effective ways to deliver, scale up and sustain both basic and comprehensive emergency obstetric care, especially for postpartum hemorrhage and pre-eclampsia, but implementation research is needed to ensure we deliver the right packages of care at the right levels of care. While globalization has affected the rising per capita income in many low- and middle-income countries, deep inequities still exist. What’s more is that measuring equity can be elusive. Researchers called for improved measures and better data to allow us to narrow equity gaps. Specifically, adolescents may suffer some of the most inequitable care, which include higher rates of obstetric complications and poorer neonatal health outcomes. 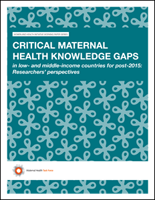 To read more details about the way forward for research and programs in maternal health, access Critical maternal health knowledge gaps in low- and middle-income countries for post-2015: Researchers’ perspectives.